Smallpox epidemics, floods, droughts—for sixteen-year-old Lucy the end of the world came and went, stealing with it everyone she ever loved. Even the landscape of her beloved New York City is ever-shifting and full of hidden dangers. As the weather rages out of control, she survives alone in the wilds of Central Park, hunting and foraging for food and making do with the little she has, while awaiting roving scavengers and thieves. But when an unrelenting pack of vicious hounds begins to hunt her, Lucy is not sure she can continue on her own. Then, suddenly, she is swept to safety by a mysterious boy named Aidan, who helps her escape the hounds and urges her to join a band of survivors. Reluctantly, she finds him after her home is destroyed; however, new dangers await her. An army of Sweepers terrorizes the camp, carting off innocent people and infecting them with the plague. Lucy and Aidan realize that it’s up to them to save their friends, but Lucy doesn’t know that the Sweepers have laid a trap—for her. There is something special about Lucy, and the Sweepers will stop at nothing to have her in their clutches. I’ve just described Ashes, Ashes in four words, which is more than the long-winded blurb writer can say as they give away 75% of the book. I have quite a few complaints about this book, but let’s start with the most obvious one, shall we? First off, the world-building stinks. I love the whole New York City under water thing, but I really hate how stupid the survivors are. They set up camp in the middle of the only large street left and refuse to move even as their numbers are decimated by the Sweepers because they don’t want to lose their vegetable garden. Yes, that may seem like a valid reason if they could actually fight off the Sweepers. But they can’t because the only weapon they have to the Sweeper’s tasers is sharp rocks and the occasional knife. Are you trying to tell me that not one single gun was left in New York City, even though they’re set up in Harlem? Now that is one of the biggest loads of crap I’ve ever heard. Secondly, the plot is so predictable it’s sickening. The blurb gives away most of it, but you can guess the last 25%. Lucy is immune to the plague (though to my annoyance we never find out why) and the betrayal is by a girl who’s jealous of her and Aidan. In the end in a deus ex machina she escapes from the evil scientist and goes on to live a happy existence at the rebel camp. Third of all, the characters are cardboard cutouts. Lucy, Aiden, Del…you could find them in any post apocalyptic novel. And the ‘romance’ between Lucy and Aidan is as cringe-worthy as the so-called love triangle in The Hunger Games. 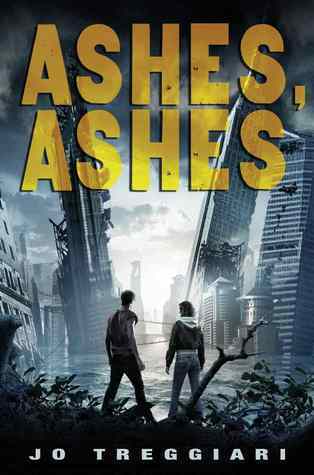 Overall Ashes, Ashes was just a bad book with nothing to redeem it. I give this book 0.5/5 stars.